The U.S. public may be feeling a pinch of inflation’s rise, but it’s nothing compared to the stranglehold it has on Zimbabweans. On Saturday, the Zimbabwe’s Central Bank issued a new Z$100 billion banknote to try and combat the severe shortages of money. How much will the new note buy? According to CNN and BBC reports, its not enough for lunch or, for that matter, a loaf of bread. Apparently, it is sufficient — at least for now — to purchase four oranges. Zimbabwe is stricken by severe hyperinflation that some news agency’s have reported as high as 2,200,000% — the Zimbabwean government stopped providing figures long ago. Contrast that to an already outrageously high of 50,000 percent reported back in January when the central bank issued new $10 million notes. The Zimbabwe Reserve or Central Bank issued notes in denominations of Z$250,000, Z$500,000 and Z$250,000 in mid December, unsuccessfully resolving the crisis. Since January, the situation has only become worse with a Z$50 million note issued and then later denominations of tens of billions. In June, daily cash withdrawal limits were increased from $5 billion to $10 billion. The new Z$100 billion notes are actually bearer checks and have an expiration date of December 31. Zimbabwe, once one of the richest countries in Africa, has not had formal currency since the introduction of bearer checks in 2003 for what was to be a temporary measure. 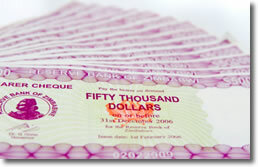 Zimbabwe had no currency since 2003 that includes Dollar Bills(Notes) and Coins. But by the way, do Zimbabwe issues Commemorative Coins? At the bottom of the page there is also a few more links regarding coins. I was wondering if I can buy as a novelty zim dollars?